Bike thieves are ruthless. Not only do they not care about the impact of bike theft on their victims, it doesn’t even occur to them. Securing your bike properly is essential at all times when you’re not riding it, even if it’s within your line of sight. Our guide will show you how. There are hundreds of bike locks and security devices available on the market, each with their pros & cons and prices ranging from £3 to £150. To help classify these different locks by the level of security they offer, locks are submitted for testing under the Sold Secure approval system, with cycle ratings awarded on a 3-tier scale – Bronze, Silver and Gold. Combination locks are easy and convenient to use. You don’t have to fiddle around with keys in the dark, there’s no risk of snapping a key inside the barrel and it’s a lot harder to lose your mind than it is your keys, in which case unlocking your bike is the least of your troubles. Their downfall is that even the best-made combination locks are relatively straightforward to pick for the average bike thief – certainly more so than a keyed lock. The result is that very few combination locks are given sold secure approval ratings, so although they are nice and convenient, they’re not recommended for use in anything other than very low crime areas. If you think of each number on a combination lock representing a pin inside the barrel, a typical combi lock will have 4 pins which are be positioned by hand. A keyed lock may have 7 or 8 pins, which can only be moved from inside the keyhole and give little to no feedback to an attacker when they are in the correct position. On the other hand, if you lose or break your keys, unlocking your bike isn’t a great deal of fun. 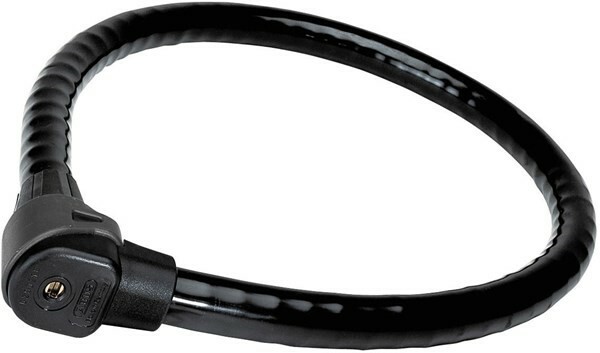 Typically made from twisted or braided steel, the flexibility of a cable lock makes it perfect for locking around awkward shaped railings or other street furniture, plus they can be coiled into a small bunch making them easy to carry around your bike frame or in a backpack. To maintain flexibility, the material used in the cable is a much softer grade of steel, and by nature of its design it is much more susceptible to cutting attacks. Because of this, cable locks rarely achieve the top gold level security rating. The Abus Granit Steel-O-Flex 1000 cable lock achieves a respectable Sold Secure silver rating, although at this level of toughness a lot of the flexibility has been lost – it won’t coil itself back up when you’re finished with it. Taking the flexibility of a cable lock and combining it with the strength of a solid bar shackle, chain locks offer a much greater level of security than cable locks. Chain locks can be quite brutish – they rely on sheer strength and size to provide the security, which can make them a bit heavy and cumbersome to carry around on a bicycle. 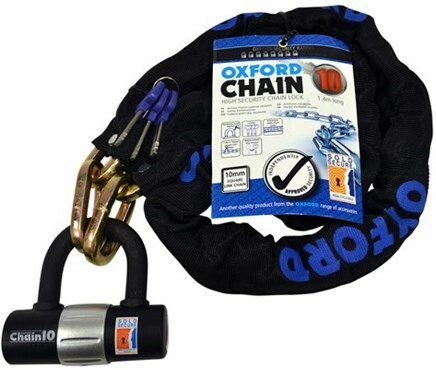 However, for home security, chain locks like the Oxford Chain10 are inexpensive and come with a Sold Secure Gold rating for bicycles. The Chain10 is even approved to Motorcycle Silver standard. One of the best solutions for bicycles is a good D-lock. Almost like a single large diameter chain link, D locks use a solid steel shackle which you loop through your frame and around a railing to secure your bike. D-Locks are more compact and lightweight than a chain lock, but offer greater security than a cable lock. D locks are generally a bit heavier and more cumbersome to carry around on a bike than a cable lock, but offer a significantly greater level of protection. D-locks can be fiddly to loop through awkwardly shaped street furniture too, as there’s no way of bending them out of shape to fit the object you’re using. One ace which D-locks keep up their sleeve is that they are even more effective when bundled together with a looped cable. If your bike has quick release wheels, seat post or other parts attached to it, locking the frame up won’t prevent someone from running off with your wheels on his way home from the pub with his mates. Looping a cable through your wheels, saddle rails and over the shackle of a D-lock will prevent these individuals from running off with important bits of your bike. 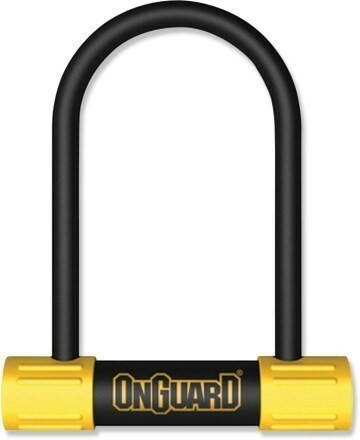 The Onguard Pitbull D-lock shackle & cable combination is gold secure rated, uses a keyed lock mechanism, 14mm hardened steel shackle and comes with a 1.2m long cable for looping through your important bike bits. Your work place may have a conveniently placed bike stores with concreted in racks, but what do you lock your bike to when you get back home? Leaving the bike unlocked inside your garden shed or garage makes it much easier for thieves to run off with. A sold secure gold lock is useless without an equally theft-resistant anchor to attach it to, which is where ground anchors come into play. 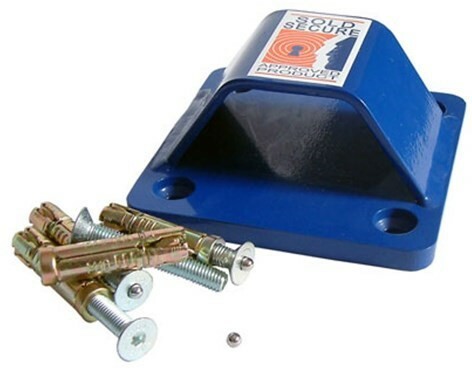 Most ground anchors use expanding bolts drilled into concrete floors or walls, such as the Gold Secure rated Squire BPGA, which are easy to retrofit to your property. Others may be permanently set into the ground, such as the Squire GA1. The beauty of ground anchors is that they can even be used outside, so if you don’t have a garage to keep your bikes locked up in, you can cover them up and chain them to a ground anchor. In the event that your bike is stolen, having it properly security marked and traceable makes it far easier to identify if it’s recovered. Datatag and Kryptonite both offer identification systems for bicycles which, combined with a database they share with the Police, helps reunite owners with their stolen bikes daily. Bike Register is another national database, also shared with the Police, to help record the details of your bike and security mark it. What’s more, Bike Register allows buyers of 2nd hand bikes to check their database for a bike’s details, so you can be sure that you’re not buying a bike which has already been reported stolen. To find out more about the bicycle security options Wheelies offer, feel free to call us on 01792 583 000 or by chatting to us via our Live Help service.